You are going to love this tip, especially since the new Stampin' Up! 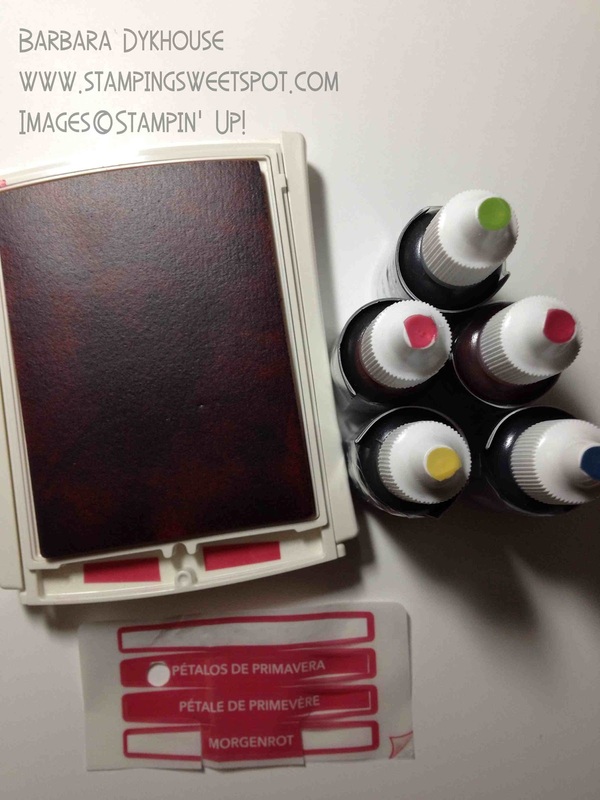 thick foam ink pads are going to be available to customers on June 1! Each of the pads comes with a multi-language label affixed to the back. You select the correct language and adhere it to the flat end of your ink pad, so you see not only the color put the color name as well. Here comes the trick! From the remaining labels, cut off some of the color from the label and stick it on the inside of the open pad. No more color confusion when you have several pads open and they are all a similar dark color! And here's another great tip for you! Use a small hole punch to punch a circle and stick it to the top of your re-inker! Now it will be easy to find the match without lifting up five or more re-inker bottles looking for the right color. Since a picture is worth a thousand words (and I know I'm still under that! ), here is what you need to see. I hope you found this helpful. Please leave a comment since I love to hear from my readers! Thanks for sharing this tip. I will most certainly use this one! !